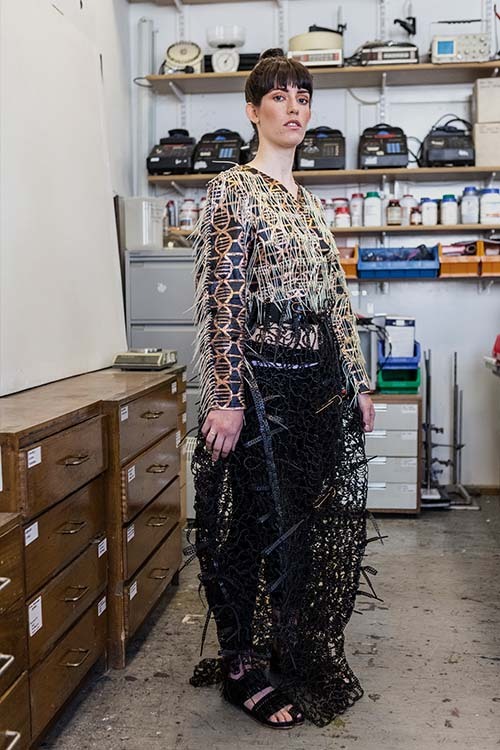 AFTER GRADUATING FROM THE EDINBURGH COLLEGE OF ART, AURÉLIE FONTAN ESTABLISHED HERSELF AS A SUSTAINABLE FASHION DESIGNER, WITH A FOCUS ON BIO-DESIGN AND CIRCULAR ECONOMY. HER GRADUATION COLLECTION, TENSEGRITY, WAS PARTLY ENGINEERED IN A SCIENCE LAB, WITH GROWN YEASTS AND BACTERIAS. IMPLEMENTING VARIOUS DESIGN STRATEGIES TO PRODUCE MORE SUSTAINABLE AND ETHICAL FASHION ARTEFACTS. AURÉLIE’S WORK REVOLVES AROUND THE “TECHNOCRAT” CONCEPT, WHERE FEMININE, EMPOWERING AND ECO-FRIENDLY LUXURY WOMENSWEAR APPAREL IS CREATED FROM THE COMBINATION OF THE LATEST AVAILABLE TECHNOLOGY AND TRADITIONAL CRAFTSMANSHIP. 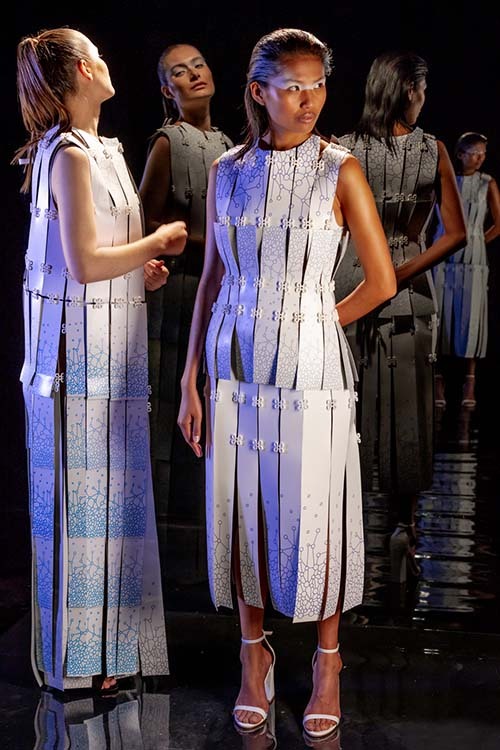 TO FURTHER THE DEMONSTRATION OF TECHNOLOGY TO THE SERVICE OF SUSTAINABLE FASHION, SHE COLLABORATED WITH SAMSUNG TO CREATE A 90% RECYCLED AND RECYCLABLE COLLECTION ONLY MADE THROUGH A SMARTPHONE. AURÉLIE CURRENTLY WORKS ON FREELANCE PROJECTS FOR FASHION BRANDS ALONGSIDE RUNNING HER RECYCLED LEATHER ACCESSORY LABEL.